Make it ten wins in the last eleven series. 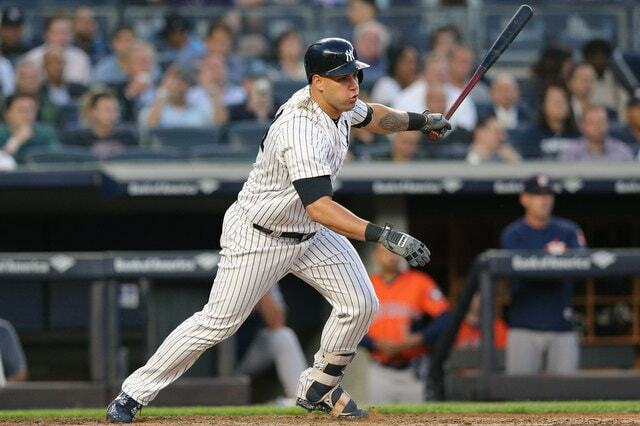 The Yankees kept rolling Wednesday night with a thoroughly satisfying 5-3 win over the Astros in the series finale. They’ve won 35 of their first 52 games for the first time since (when else?) 1998. They started 39-13 that year. The 2018 Yankees aren’t quite that good, but they’re good. Great, even. Love this team, you guys. Luis Severino allowed two runs in seven innings against the defending World Series champions Wednesday night and his ERA went up. Yep. He’s been that good this season. Severino went from a 2.28 ERA (2.71 FIP) to a 2.31 ERA (2.27 FIP) with this start. This was his 12th start this year and the Yankees are now 11-1 in those games. When Sevy starts, it’s win day. … that Stassi managed to tomahawk into the visitor’s bullpen. Only the fourth home run Severino has allowed this season. Go deep on an upper-90s heater elevated that much, and I’m okay with tipping my cap. What can you do? The Astros threatened again in the seventh, when a Miguel Andujar error and an Evan Gattis single put two on with one out. Severino rebounded to get a fielder’s choice from Stassi and an inning-ending strikeout of pinch-hitter George Springer. He threw Springer the F.U. slider there. 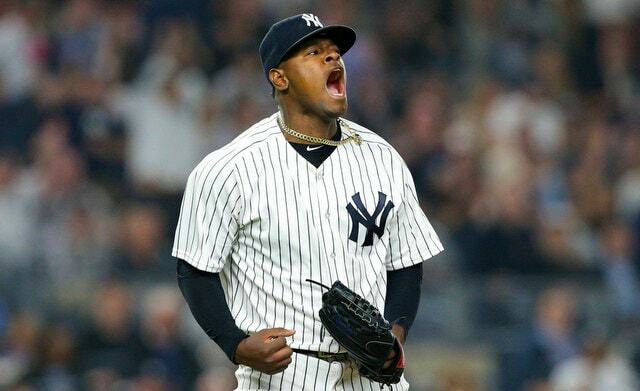 Severino’s final line: 7 IP, 4 H, 2 R, 2 ER, 1 BB, 11 K, 1 HR on 103 pitches. He got 15 swings and misses and his average exit velocity allowed was 82.2 mph. That is fan-freaking-tastic. Swings and misses and weak contact. Severino gets both. Also, this was Severino’s third double-digit strikeout game this season. One of the others was his shutout in Houston last year. The Astros have some great starting pitchers. I’d put Sevy up against any of ’em. So we can officially remove the Yankees Killer™ label from Dallas Keuchel now, right? Keuchel allowed seven earned run in his first 57.2 career innings against the Yankees, postseason included. But, since Game Five of the 2017 ALCS, they’ve tagged him for 12 earned runs in 16.2 innings in three starts. That includes four runs in five innings Wednesday night. Yankee Killer™ no more. The Yankees jumped on Keuchel early Wednesday. Aaron Hicks walked, Aaron Judge singled, and Giancarlo Stanton ripped a sacrifice fly — it was more like a sacrifice line — to center field to give the Yankees a 1-0 first inning lead. Jake Marisnick made a great diving catch to take a base hit away from Stanton. The Yankees were able to put runners at second and third with one out later that inning, but alas, they couldn’t capitalize. Tyler Austin struck out and Gleyber Torres lined out. It’s no secret Gary has been struggling of late — he went into that at-bat in an 0-for-19 skid, and he had some ugly at-bats Tuesday night — and it was good to see him do exactly what he should’ve gone with that pitch. Inside-out it the other way. There is no pulling that pitch. Try to pull it and you’re going to roll over on it for an easy ground out. 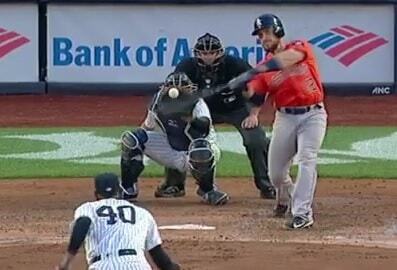 To use a cliche, Sanchez hit it where it was pitched. Hooray. Keuchel’s final line: 5 P, 7 H, 4 R, 4 ER, 3 BB, 7 K on 106 pitches. Feels good. It was starting to look like the Yankees would really regret stranding those two runners in the first inning, but they were able to get to Keuchel late. 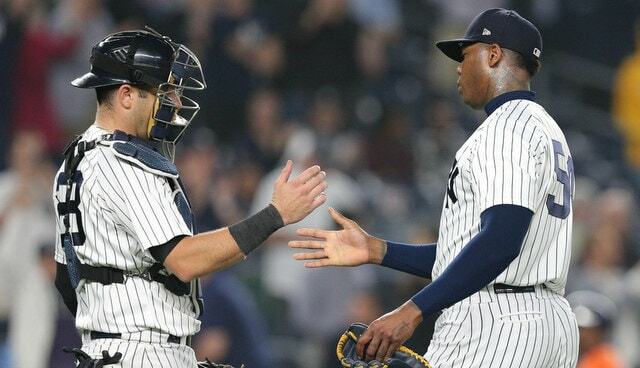 The Yankees added two insurance runs in the sixth inning when Torres doubled and Sir Didi Gregorius singled him home, and Gonzalez missed a dive on a Hicks blooper to left, allowing it to get by him for a run-scoring double. David Robertson still doesn’t look right. He pitched around a one-out single in the eighth inning but fell behind 3-0 on the first two batters he faced, and was generally wild. Robertson looks a little out of sync for whatever reason, but at least he’s not allowing runs anymore. Aroldis Chapman did allow a run in the ninth — it was the first run he allowed since May 4th — before striking out and staring down Springer to end the game. Pretty badass. That seventh inning fielder’s choice by Stassi? Yeah, that was not routine. Yuli Gurriel and Andujar collided on the infield. Andujar was going for the ball and Gurriel was going from second to third, and they plowed into each other. Gurriel is a jerk, but it didn’t look intentional to me. The out was called on interference and Andujar was okay, thankfully. Gregorius seemed to get a pretty good laugh out of it. Rough day for Austin, who went 0-for-4 with four strikeouts. He is now 0-for-16 with eleven strikeouts in his last four games and 6-for-46 (.130) with 22 strikeouts this month. Not good! The Yankees kept Austin on the roster over Ronald Torreyes so he could mash lefties like Keuchel and, well, he didn’t do that Wednesday. The Yankees are scheduled to face nine righties in the next nine days. I wonder what happens with Austin. Hicks (walk, gift double), Judge (two singles), Stanton (single, walk), Sanchez (single, walk), and Romine (single, walk) all reached base multiple times. Gleyber and Didi each had a single. Romine is hitting .358/.433/.604 (183 wRC+) this season. What in the world is going on here? Whatever it is, it’s awesome. The homestand is over and the Yankees are heading out for a four-city, eleven-game road trip. Fortunately one of those four cities is New York for a series with the Mets at Citi Field. Anyway, four games in Baltimore are up next. First trip to Camden Yards this season, if you can believe that. Sonny Gray and Andrew Cashner are the scheduled starters for Thursday’s series opener.